I hate these pictures. I never got a good one. 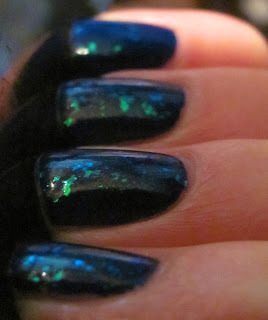 But the actual, in person look, was very pretty and near holographic. I painted four total coats for this layered effect: two coats China Glaze First Mate with one coat on top of Orly Royal Navy, finishing with one coat of Finger Paints Flecked. 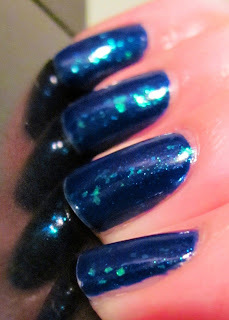 Seche Vite was my top coat. I like that layering combo.